Retro Game Master has a new home in North America, streamed live on Kotaku every week at 8 p.m. eastern. But what if you miss it? Don't worry, we've got your back. Unlike television, we don't tuck away our shows after we're done "airing" them. 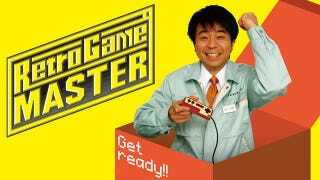 Feel free to hop on over to the page dedicated to all things Retro Game Master to read up on our coverage or hit up the links below to rewatch, or watch for the first time, the episodes we've already aired. And don't forget to swing by on Thursday at 8 p.m. eastern to watch the show live and comment with fellow fans. This first official U.S. airing of the show, known as Game Center CX in Japan, uses dubbing for the announcer's voice and subtitling for Arino's.